Sign in to your account to get your score now! It’s important to know and stay on top of your credit score for any future financial decisions. VantageScore will allow you to track your score over time to watch how it is trending. 1 Score is displayed for primary borrower only, and will be updated quarterly. VantageScore is a credit rating product offered by the three major credit bureaus (Equifax, Experian, and TransUnion). The VantageScore was developed as a tool to compete with the FICO score, which is well known to most people. VantageScore is a tool used by lenders and creditors in making lending decisions. Keep in mind, your VantageScore credit score will vary between the three credit bureaus. While the major credit bureaus use the same scoring model, the information on your credit report may differ from bureau to bureau. OneMain customers can get their most current score from Experian for free by logging into your account at OneMainFinancial.com. Getting a copy of your VantageScore credit score is easy for OneMain customers. Log in to your account at OneMainFinancial.com and you will see your most current score displayed on your account summary page. You can also use the links on that page to see how your score has evolved over time. The score is displayed for primary borrower only, and will be updated quarterly. If you don’t have an account yet, sign up now! If you are not currently a OneMain customer, you can get your VantageScore by contacting one of the three major credit reporting agencies (TransUnion, Experian, or Equifax) to request your current score. A fee may apply, however. What influences your VantageScore credit score? 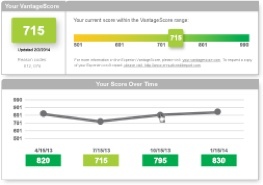 How is VantageScore credit score different from a FICO® score? The FICO® score is a proprietary credit scoring methodology developed by the Fair Isaac Corporation. The VantageScore credit score was developed by the three bureaus as a competitor to FICO® score. Here are some of the main differences between VantageScore and FICO®. Takes into account 6 components of your credit report; payment history, utilization, balances, depth of credit, recent credit, and available credit. Takes into account 5 components of credit report: payment history, amount of debt, credit history, types of accounts, and inquiries. VantageScore claims to score consumers with little or no credit history more accurately. Consumers with little or no credit history often cannot generate a credit score at all, or are scored with inflated, high scores because they have few credit actions on file. Will my VantageScore credit score vary between the three credit bureaus? Yes. While all three bureaus use the same scoring model, the information on your credit report may differ from bureau to bureau. How do I get my VantageScore credit score? Getting a copy of your VantageScore credit score is easy. If you are a current OneMain customer, you can get your score now through OneMainFinancial.com. All you need to do is create an online account at OneMainFinancial.com, if you don’t have one already. Why have I noticed such a big change in my VantageScore number when I recently logged into my online account? We've recently upgraded to VantageScore 3.0, a newer version that more closely aligns with FICO scoring. Scores for this updated version range from 300 to 850 (the same as FICO), so your new credit score shown above is likely to be noticeably different than before. While the change is likely due to the upgrade, your recent credit activity may have also impacted your score. Your credit score will continue to be updated quarterly on your account management page, as it always has. Can my credit score change over time? Since a score is based on frequently updated credit files, it will likely vary over time. Lenders aren't the only ones who may use your credit score. For example, landlords and cell phone companies may also use a credit score to determine the amount of deposit required. What do the codes on the credit report mean? The codes that appear on your credit report are usually reason codes. Reason codes are letters and numbers that typically correspond to a description, which help you understand how information in your credit report affect your credit score. Sometimes reason codes are called score factor codes. When you receive your credit score, you will also see "reason codes" that are provided to help you understand the factors affecting your score. ReasonCode.org is a website dedicated to helping you better understand reason codes and how you can improve your scores based on the reason codes you have received. The credit score provided is for educational purposes only. We do not guarantee that the credit score shown will be used by us or third parties to assess your creditworthiness or eligibility for any particular product or service or for employment.